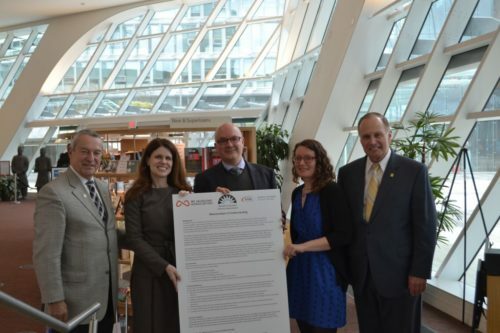 In 2017, an MOU was signed between the BC Museums Association (BCMA), the Archives Association of BC (AABC), and the BC Library Association (BCLA). The historic agreement, the first-of-its-kind in Canada, formalized cooperation between the three sectors in British Columbia, with each organization pledging to share expertise, embark on cooperative projects and outreach initiatives, and explore collaborative funding opportunities. The text of the MOU is available here. 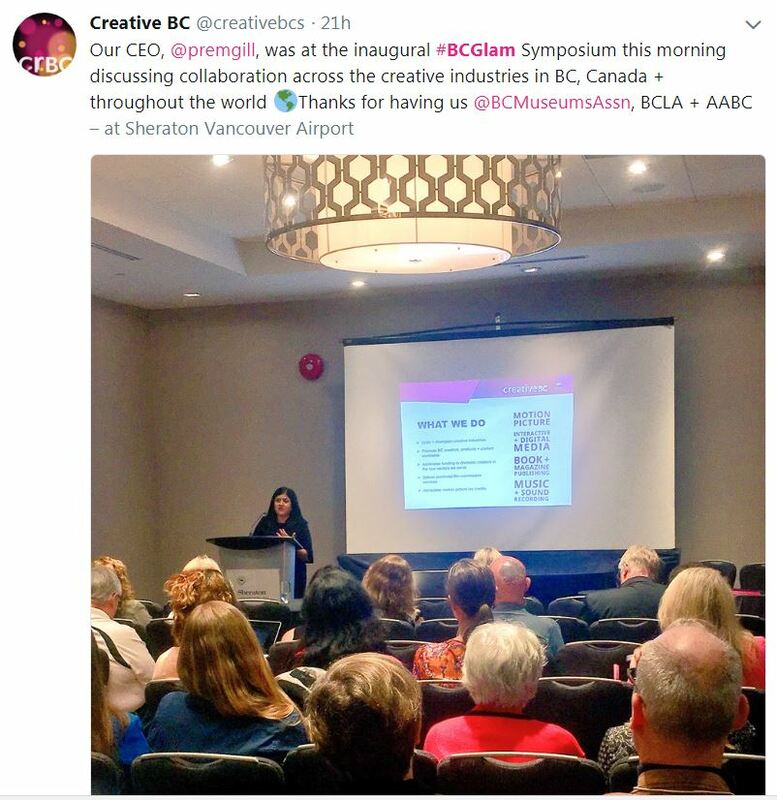 The first major outcome of the MOU was yesterday’s GLAM Sector Symposium – a first for BC and an event that will hopefully become an annual, pun-filled affair. Held in Richmond, the Symposium drew participants from all over the GLAM sector (for those unfamiliar with the terminology, GLAM refers to Galleries, Libraries, Archives, and Museums). Rhiannon Bennett welcomed participants to gather on the unceded territory of the Coast Salish Peoples and provided a powerful reminder of the role the GLAM sector must play in the journey towards reconciliation. It was an important theme that was carried through the rest of the day. Past President of the BCLA, Daphne Wood, opened the day by encouraging participants to employ divergent thinking to stimulate creativity and explore new ways to collaborate across the GLAM sector. To help us get the creative juices flowing, Prem Gill (CEO of CreativeBC) gave the opening keynote and took participants through the innovative process her organization followed with the aid of Dr. Angele Beausoleil (then of UBC) to arrive at its strategic direction- what Gill calls the “Service Innovation Plan.” During the Q&A, an interesting question was raised that we all contend with – how do we measure the impact of the creative sectors? How do we convince people that they matter when the sense of belonging and connectedness cannot be linked to dollars. There are no easy answers, but this was a further reminder that we have to keep trying. Following the keynote, a panel of government representatives outlined some strategic policy directions for the GLAM sector. The panel included Mari Martin, Ministry of Education; Laurel Nash, Ministry of Indigenous Relations & Reconciliation; and Richard Linzey, Ministry of Forests, Lands, and Natural Resource Operations and Rural Development – wow, I hope he doesn’t have to put all that in his email address! 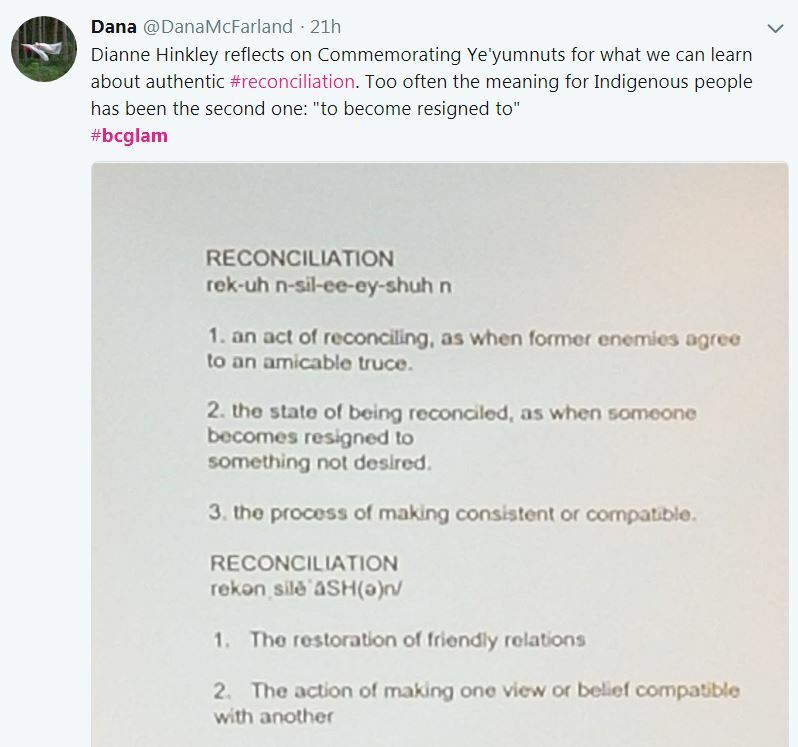 The importance of the UN Declaration on the Rights of Indigenous Peoples (UNDRIP) and the Truth and Reconciliation Commission’s Call to Actions were front and center in the discussions. Richard Linzey noted that there is an important shift happening in the cultural sector in government – that is the move from being experts with imposed answers to acting as facilitators in the larger conversations with community members. Laurel Nash explained that the BC Government is committed to developing “cultural intelligence” among public servants through training programs that are being rolled out first among senior managers, later to be delivered widely to staff. Mari Martin noted that the training has fundamentally changed the way she thinks. The Indigitization Project – providing technology and guidance to enable digitization of indigenous recordings. Check out the promo video here. As a powerful conclusion to the GLAM Slam, Melissa Adams (Librarian and Archivist for the Union of BC Indian Chiefs) left participants with an important message: “Take responsibility for your own learning.” To help, she provided an invaluable handout entitled “So, you want to learn about Indigenous peoples…” based on her twitter thread that explored the same theme. The symposium concluded with some final remarks by the current presidents of BCMA, AABC, and BCLA. The conclusion was that while we all talk to our audiences in different ways, the GLAM sector has the same ultimate goals. We need to remember this and get out of our silos! The three organizations will continue to work together to further the impact of the MOU. Finally, members of the sector should stay tuned for the GLAM Toolkit – a living document of templates and resources to assist individual members to grow existing partnerships and to create new ones within their communities.